"A Dalek so damaged it's turned good," the Doctor says. And so begins the latest episode of Doctor Who to attempt something more interesting with the Doctor's archenemies than the just usual exterminations. This time it's a double-dose of the unexpected: not only is Rusty a "good" Dalek, but the Doctor is going to head inside the alien's metal shell, all tiny and shrunk, Fantastic Voyage-like. But as we begin the episode, there's actually precious little evidence that Rusty is all that good. He hasn't exactly joined Oxfam or anything. He hasn't gone to medical school so he can cure AIDS. He hasn't expressed even the faintest hint of any love for anyone at all. In fact, he's still full of genocidal rage. The Doctor just thinks he's good because all that rage has been turned against the Daleks. In the Doctor's never-ending war against the evil salt shakers, Rusty is on the Doctor's side. On the side of the good guys. And that, of course, is too often how people see things during violent conflicts: the good guys are the good guys because they kill bad guys. But it's not that simple — unless you're George W. Bush or Joseph McCarthy. That kind of thinking has led to some of the most shameful moments in the history of the democratic world. We're not the good guys because we don't torture. We're the good guys because we torture the right people. We torture bad guys to save good guys. On the Doctor's darkest days, he too is vulnerable to that kind of thinking. In fact, in this episode we learn that it has been a central part of his concept of himself ever since he went to the Dalek home world all the way back in the second Doctor Who story ever. "I met you lot," he tells Rusty, "and I understood who I was. Who I had to be. I was not you. The Doctor was not the Daleks." He has spent 2000 years believing that his opposition to the Daleks makes him who he is. And we already know that the Doctor's opposition to the Daleks tends to manifest itself in a genocidal rage. It's no surprise that Rusty finds a wealth of hatred in the Doctor's hearts. The Fourth Doctor seriously considered wiping out the entire species. The Seventh Doctor blew up their sun. The War Doctor planned to destroy them all. And when it turned out that a few had escaped, the Meta-Crisis Tenth Doctor — with help from Dalek Caan, another Dalek turned "good" — gave it another go. Even as recently as the 50th Anniversary Special, when the three Doctors teamed up to save Gallifrey from the Time War, they did nothing to undo their genocide of the Daleks. They chose to do it again. After all, Daleks are irreversibly evil. Except now, maybe they're not. Rusty, with his capacity for change, shakes the Doctor's identity to the core. If his belief in his own goodness is deeply linked to the killing of Daleks, what does it mean if Daleks aren't always necessarily pure evil? No wonder the Doctor's first reaction to being confronted with Rusty is to go find Clara and ask her if he's a good man. No wonder he's not sure of the answer himself. No wonder he wants his companion along for this particular mission. 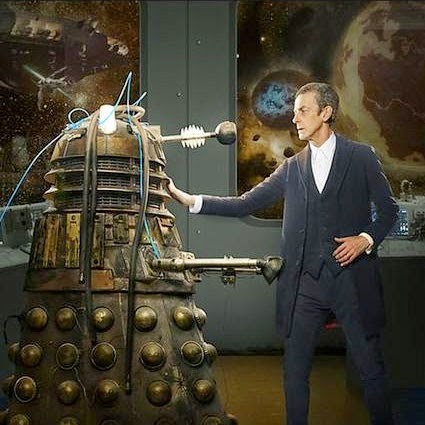 And no wonder he's so eager to believe that Rusty's post-radiation return to murder-as-usual proves that Daleks are irreversibly evil after all. As Clara points out, if Rusty is evil it means, "Everything makes sense. The Doctor is right." But more than that, it would also mean that the Doctor is good. Not just this time, but ever since the beginning. It would mean that he doesn't have to question 2000 years of his own prejudice and genocidal hatred. But he should be questioning them. Everyone should always be questioning their own prejudices. Even more so when you're a quasi-immortal Time Lord with a temper who makes life and death decisions all the time. In fact, the act of questioning yourself is a vital part of being a good person. Or even a good society for that matter: democracy is, in a way, an endless stream of questions asked in parliaments, in elections, in debates, in public inquiries, by ombudsmen and by the media... The Daleks don't question; they unquestioningly follow their orders like soldiers are supposed to — the Doctor hints at that while getting Journey Blue to question hers. That's why the Doctor needs Clara, after all, why he always needs a companion: to be "the asking questions one." Questions not just about the plot so the audience can understand what's happening. But questions about what the Doctor is doing. Whether it's good. Whether he is, in fact, being a good man. And so, the question "Doctor who?" isn't just a mystery to be solved some day. It's a continual process. A blueprint even. A guide to being good. Choosing to have a companion there to keep asking that question means the Doctor is — at the very least — pointing in the right direction. He is trying to be good. And as Clara tells him at the end of this episode, "I think that's probably the point." Because, as we can see with Rusty, unquestioning hatred of the Daleks doesn't make you a good man. It makes you a good Dalek. - Of course, Doctor Who has also never argued that it's as simple as believing the opposite of all this, either: that killing bad guys automatically turns you into a bad guy. And it looks like something along these lines might be a big theme this season. With the solider Danny Pink being a recurring character — and with Missy, who might be collecting characters the Doctor has sacrificed/convinced to sacrifice themselves. Plus, as was pointed out on the Verity! podcast this week, twelve episodes might potentially mean twelve dead characters in heaven by the end of the season. Twelve jurors? - Pink and Blue? It is that just part of the metaphorical mirroring all over this episode? Or are going to learn more? Maybe, with it, more about the Combined Galactic Resistance? Could Danny Pink be a veteran of a interstellar war? - I love the way the Twelfth Doctor has been casually flipping the lever the TARDIS — a stark contrast to the manic flourishes of the Eleventh. - Fun callback to classic Who, when the Doctor says Clara is "not my assistant, some other word." The companions used to be called assistants. Between that and wanting more round things on the way of the TARDIS, the Twelfth Doctor seems to have a bit nostalgia for the old series. - Mark Rozeman points out in Paste: "one of The Dalek’s initial phrases back in their '60s iteration was 'resistance is useless,' which was later re-purposed by Star Trek's The Borg as 'resistance is futile' in the '80s; The Dalek uses the 'futile' line… which can't help but feel like a betrayal..."
- Dan Martin points out in The Guardian: "Production geeks will notice a lot of co-writer credits this year, something we've not seen before. At first I wondered whether this was Moffat getting exasperated at rewriting everybody’s scripts. But it looks as if he's writing Clara and Danny’s love story on his own and weaving that into other people’s adventures. That stuff is very Coupling." - He also points out that "in the Dalek’s memory bank is a sequence from 2008’s Journey’s End. So Rusty was in that battle." - "The Daleks are exterminated." "Of course they are. That's what you do, isn't it?" Uh, kinda what you do too, Doctor. - "Ah, you shoot people and then cry about it afterwards." Helloooooo Tenth Doctor. - Lots of echoes, of course, to the episode "Dalek" from the very first season of the reboot. Including the Doctor being told by the Dalek that he "would make a good Dalek." Read our previous recap of Doctor Who, "The New, Dark Doctor Who" here.